Research assistant in Geology at Portsmouth Polytechnic from 1967 -1971, visited Greenland 1968 with BJW, worked on ultramafic rocks from Frederikshaab district - Igaussaq area, did Master's thesis on 'Carbonatite Lamprophyres' from the same area, originally described by BJW. 1971-73 worked as a research assistant for Stuart Agrell and Jim Long at Dept. of Mineralogy & Petrology in Cambridge, working on lunar rocks from Apollo 14, 15, 16. 1974-76 set up microprobe laboratory for Rhodes University, Grahamstown, South Africa, with Prof. Hugh Eales. 1988-89 became a motor dealer in Pinetown, near Durban. !990-95 having lost my shirt (and underpants!) joined a chemical company specialising in Industrial water treatment as a technical salesman based in Pinetown. 1996-99 bought new underpants...ran an Industrial water treatment consultancy in KwaZulu - Natal. 1999-2005 ran a microprobe laboratory for the University of the Witwatersrand in Johannesburg. Saw Brian Walton once again after almost 30 years when he visited Wits July 2004. I am now working as an R&D Consultant with the Pratley Group in Krugersdorp - all our microprobes are there and Pratley's have bought 3 scanning electron microscopes: the one we collected in Grahamstown, the one we used to use at Moruo Minerals, and another from a company in North Carolina! So we are quite busy these days. Love & best wishes from Theone, Allan, Angela, Tyler, the cat & the dog. Michael graduated as a mature student. Following the degree he completed a teacher training course for one year and then spent the remainder of his working life working at Oak Park School on the Leigh Park Estate, Havant. It was a very difficult school and in those days there were many new initiatives to make science more accessible to the less able. Michael really worked hard at making science understandable to all. Basic geology was included in these new courses. Sadly, Michael died in 2003. Give my regards to Mike Ryan and any others. I'll be in Portsmouth at the end of June/early July this year. Who knows? After graduating I spent the customary 6 months or so looking for a job. Then, sometime early in 1969 I got offered a job back at Portsmouth in the Geology Dept as Curator, followed a week later by an offer of a job from BP to work in the Oil Industry in Alaska. Having already accepted the first, and being a bit naive in those days, I didn’t feel I could bin the first and take the second. I often wondered about that in subsequent years....At Portsmouth I didn’t really take full advantage of things and should have bashed the research better than I did and got some stuff published or submitted. But I was given a wonderful opportunity there to develop lecturing skills, which I did take full advantage of and loved it, eventually being employed as part time lecturer. I also did some lecturing to ‘A’ Level students at Highbury Tech. Chickens came home to roost however, when, having applied for an L1 at Portsmouth, Griffin, head of Chemistry came to see me the day after the interviews and told me I’d done a "better effing job of the interview than the other baggars" but the guy they gave it to had much stronger research. That was the point at which I decided I’d better get out and move on as I was going to get nowhere in academic circles. So in response I started looking for other jobs, eventually turning up a job as a mining geologist with the NCB in Wales. So I left Portsmouth in the summer of 1975 – exactly 30 years ago.It must be said that working as a geologist in the coal mining industry – particularly open pit mining must have been one of the most rewarding geology jobs in industry that could be found anywhere. It provided the opportunity to carry out original subsurface investigations supervising drilling rigs and carrying out geophysical logging and the interpretation of the subsurface geology from the data gathered and evaluation of the minerals found. It encompassed structural geology, stratigraphy, sedimentology, hydrogeology, geophysics, and geotechnics. I loved it – particularly the production of subsurface geology maps from borehole and geophysical data and the quantification of minerals. The NCB were at the forefront of computer technology for such purposes and we eventually ended up with computer systems which enabled the generation of 3 dimensional subsurface structural models from borehole data. For the likes of me, interpretation of the complex geological structures in the South Wales Coalfield was a delight. I spent most of my time in the NCB in Regional HQ preparing the geological maps, sections, plans, reports and quantities which formed the basis of mining contracts.I got reasonably rapid promotion, eventually becoming Regional Computation Geologist in charge of a team of geologists. This was as high as one could go in the NCB whilst still being ‘hands on’ with the technical stuff. I neither wanted or ever applied for higher management jobs where one became a ‘paper shuffler’. The post disappeared in one of the many NCB ‘reorganisations’. I have to admit I really missed working with students. I found it most rewarding for example to show students how to do Bennison maps, how to log a rock sequence in the field, or the mysteries of sedimentary rocks under the microscope. Just some of the things I had done at Portsmouth.So, when in the early 1980s, the Dept of Mineral Exploitation at Cardiff University asked if someone could give a couple of lectures to students on techniques in the coal mining industry I jumped at the chance. (Interestingly, most of the people I worked with, had the horrors at doing such a thing!) I gradually built this up from a couple of ‘one off’ lectures to a full course in exploration, subsurface mapping, geophysics, and evaluation of reserves, in Coal Measures strata to Undergraduate students. So my lectures must have gone down ok. Eventually, I was given an Honorary lectureship in the University of Wales in recognition of my efforts. The last lectures I gave at Cardiff were to classes of MSc students in Mineral Evaluation. This course eventually wound up through lack of (overseas) students. My dealings at Cardiff were mainly with Dr AE Annels. Mainly through his efforts of persuasion I gave a lecture at an International Symposium on mineral evaluation on wireline geophysics. The Proceedings were published so I had my name in print (at last!) tagged to paper on geophysics. If, in 1968 when Pete Jones was teaching us the basics of geophysics, someone had predicted that one day I’d have my name in print, attached to a paper on geophysics, both he and I would have fallen down laughing and retired to the pub for a calming drink! Alwyn Annels also asked me to contribute to a book he was writing on mineral deposit evaluation. This I duly did and it appears under the Case Histories section of the book. Material like this becomes so out of date so quickly that I did a revision a few years later for the second printing/edition. In 1994 the Government of the day decided to ‘privatise’ the mining industry. It was obvious to all that this was just a blind to get rid of it since they had put in place enough gas fired power stations to take over from coal. It was a mystery to all of us in the industry why precious gas reserves should be used to generate electricity. So thousands of us, including most of the geologists, were simply made redundant. When I joined the industry in 1975 there were over 60 collieries and over 20 open pit mines working in South Wales. Now there is one colliery and I think 3 open pit sites. In 1995 I did get a job with a successor company for a short while and have worked for them since on a consultancy basis from time to time. Otherwise I have simply done odd consultancy jobs when asked – from quarry design to supervision of drilling for water and uncharted abandoned underground mine workings, but I ceased doing such things in 2003 and am in effect retired. Publications: MacCallum, R. 1992. Geophysical logs and the search for opencast coal reserves. In: Case Histories and Methods in Mineral Resource Evaluation. Geological Society Special Publication No 63. pp.77-93. MacCallum, R. 1991. Opencast Coal Mining in South Wales. In: Mineral Deposit Evaluation-A practical approach by A.E. Annels. Chapman & Hall. pp. 364 – 380. 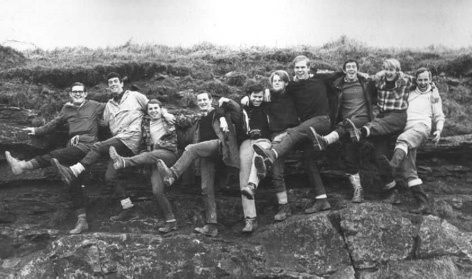 1966-1969 Portsmouth Polytechnic, BSc Special Upper 2nd Class Hons.Geology (Mature student). Commenced at the Univ. of the Witwatersrand. Completed at the Univ. of Western Australia. 1967 Geological Survey of Greenland - employed for 3 months geological mapping in SW Greenland. 1968 Geological Survey of Greenland - employed for 3 months geological mapping in SW Greenland. 1969 Quebec Dept.of Natural Resources - employed for 3 months geological mapping in SE Quebec. 1969-74 Anglo American Corp. - gold mine geologist - President Steyn GM, FSG Gold Mine, Welkom GM. 1980-81 Western Mining Corp. - senior research geologist - gold deposits, based in Perth and then Melbourne. throughout Australia, New Zealand, PNG, Solomons, Fiji. 1989-1991 Normandy Ltd. - senior research geologist - Proterozoic Studies, gold & base metals. 1991-1998 Normandy Ltd. - exploration manager, S.E.Asia. Set up and managed exploration offices in Vietnam and Laos, also explored in Indonesia and Thailand. RETIRED IN 1998 and living with my wife, Chris in Melbourne, Australia. John has sent in a fascinating account of his geological career and life from 1966 to 1998.